I want to share with you this month a natural, effective way to protect your skin from the sun’s dangerous ultraviolet (UV) rays. These rays can prematurely wrinkle our skin and cause cancer even when cloud cover is present. While it’s always important to remember to wear sunscreen outside, our skin can still be damaged from prolonged sun exposure after slathering it on and not becoming sunburned. Fortunately, recent research indicates that we can protect our skin from within by eating enough of a particular common food. Not only can this food protect us from sun damage, but it also helps our skin stay young and elastic. Remember that if you’d like to ask your own question, go to www.oakwaynaturals.com and click on “Ask-the-Doctor” under “Doctor’s Corner” on the menu bar, or simply click here. A study presented at the British Society for Investigative Dermatology, by researchers from the Universities of Newcastle and Manchester, found that supplementing your diet with lycopene-rich tomato paste can protect your skin from within and serve as a secondary defense against the harmful effects of the sun. Lycopene is a bright red phytochemical found in tomatoes. Lycopene is actually present in a multitude of fruits, including watermelon, guava, papaya, apricots, pink grapefruits and red oranges, but 85 percent of our dietary intake of lycopene comes from tomatoes and tomato products. Lycopene acts as an antioxidant in the body, protecting cells against damage from the free radicals formed when cells burn oxygen for energy. To anyone who knows the biological functions of lycopene in nature, the claim that it can also protect us from the sun makes sense. People who have heard of lycopene may know that it is what gives bright colors to the fruits and vegetables that contain it, but this is only part of what lycopene does. Lycopene also plays multiple roles in photosynthesis, which is how plants convert energy from the sun into energy they can use for activities. Most important to us, though, is how lycopene protects organisms from excessive light damage. It is this light-protection function that spurred researchers to look into its human applications. The reason UV light is harmful to the skin is because daily exposure to solar radiation causes cells to produce reactive oxygen species (ROS), which are a primary factor in skin damage. Sun damage from UV exposure includes premature wrinkles and skin cancer. Lycopene seems to reduce production of ROS, according to a study presented by the researchers from the Universities of Newcastle and Manchester. They divided their subjects into 2 groups; those who were lycopene and olive oil-supplemented and those who just received olive oil. Skin samples taken from t he test subjects indicated that those who supplemented with lycopene-rich tomato paste had 33% more protection from sunburns than the other group. The tomato paste group also had higher skin levels of pro-collagen; the molecule which gives skin its structure and the loss of which leads to skin aging and lack of elasticity. Additionally, there was less damage to mitochondrial DNA in the skin of the tomato paste group, which is also believed to be linked to skin aging. It should be noted that supplementing with lycopene is not an alternative or replacement for proper sunscreen use, but rather appears to be a good compliment to it. If you like tomatoes and eat at least one of them most days, then you are likely getting enough lycopene from your diet to harness its skin-protecting, health-boosting benefits. If you do not like tomatoes or just don’t eat them very often, lycopene supplementation could help protect your skin and protect you from other health concerns like cancer and strokes, according to studies published in Journal of the National Cancer Institute and Neurology. Pure Encapsulations makes a great Lycopene supplement that makes it as easy as possible to get the skin-protecting benefits of lycopene. 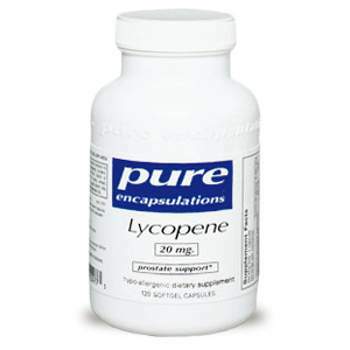 Pure Encapsulations Lycopene provides a natural tomato extract rich in lycopene, various carotenoids, vitamin E, and other important phytochemicals. In one study involving 30 male subjects, supplementation with lycopene promoted healthy prostate function. A study presented at the British Society for Investigative Dermatology, found that supplementing your diet with lycopene-rich tomato paste can protect your skin from within and serve as a secondary defense against the harmful effects of the sun. The reason UV light is harmful to the skin is because daily exposure to solar radiation causes cells to produce reactive oxygen species (ROS), which are a primary factor in skin damage. Sun damage from UV exposure includes premature wrinkles and skin cancer. Lycopene seems to reduce production of ROS. Lycopene is a bright red phytochemical found in tomatoes. Lycopene is actually present in a multitude of fruits, including watermelon, guava, papaya, apricots, pink grapefruits and red oranges, but 85 percent of our dietary intake of lycopene comes from tomatoes and tomato products. Lycopene acts as an antioxidant in the body, protecting cells against damage from the free radicals formed when cells burn oxygen for energy. To anyone who knows the biological functions of lycopene in nature, the claim that it can also protect us from the sun makes sense. Lycopene is what gives bright colors to the fruits and vegetables that contain it, but this is only part of what lycopene does. 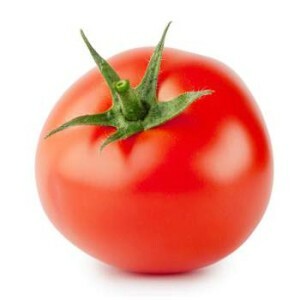 Lycopene also plays multiple roles in photosynthesis, which is how plants convert energy from the sun into energy they can use for activities. Most important to us, though, is how lycopene protects organisms from excessive light damage. It is this light-protection function that spurred researchers to look into its human applications. The tomato paste group also had higher skin levels of pro-collagen; the molecule which gives skin its structure and the loss of which leads to skin aging and lack of elasticity. Additionally, there was less damage to mitochondrial DNA in the skin of the tomato paste group, which is also believed to be linked to skin aging. It should be noted that supplementing with lycopene is not an alternative or replacement for proper sunscreen use, but rather appears to be a good compliment to it.